Disclosure: I was provided with these paints and stencils from PLAID free of charge in exchange for my fair and honest review. Please see my disclosure policy. This post also contains affiliate links, which means that at no extra cost to you I can make a tiny bit of money to help support this blog. Thank you! I love making temporary wall art from canvas panels – they’re much cheaper than stretched canvases (I use 8×10″ panels which are a great size for kids – and you can get them in packs of twelve for less than $12!). This makes them perfect for seasonal use – either put them in a frame and switch them out with each season, or prop them up against a wall on a side table or similar. 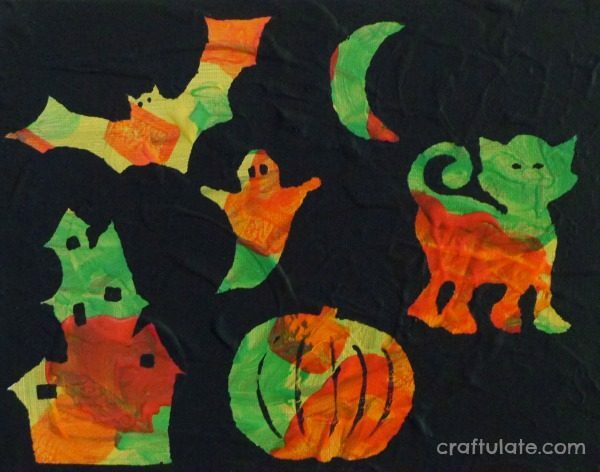 My son made this “BOO!” wall art a while ago using the tape resist technique. 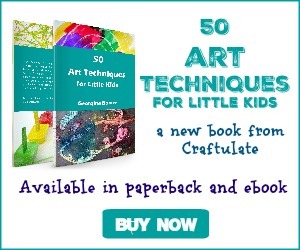 The tutorial for this can be found in my book 50 Halloween Crafts for Little Kids. What I love about all kinds of resist art is that the child plays a huge involvement, but can be as random as they like. No direction or guidance needed – other than “fill the page!”. So for Halloween I wanted to experiment with some cool Martha Stewart Glow-in-the-Dark paints I received from PLAID crafts. We used all three colors: yellow, orange, and green. My son painted the canvas panel but mixed up the colors to form, well, glow-in-the-dark brown? 🙂 So after it had dried we painted over the brown, but in separate patches of color. I printed out some Halloween shapes onto card (although I did use the cat outline from the Plaid Stencils – Icon Value Pack). I used super thin 0.25″ wide painters’ tape to attach them to the dried canvas. The cat was particularly tricky – the pumpkin was easy! Then we painted over everything with Apple Barrel Jet Black. It’s a good idea for your child to apply the paint with a roller because it reduces the chance of excess paint seeping under the stencils. We gave it two coats just to be sure everything was covered! When the paint had dried, we carefully lifted off the stencils to reveal the colors underneath. 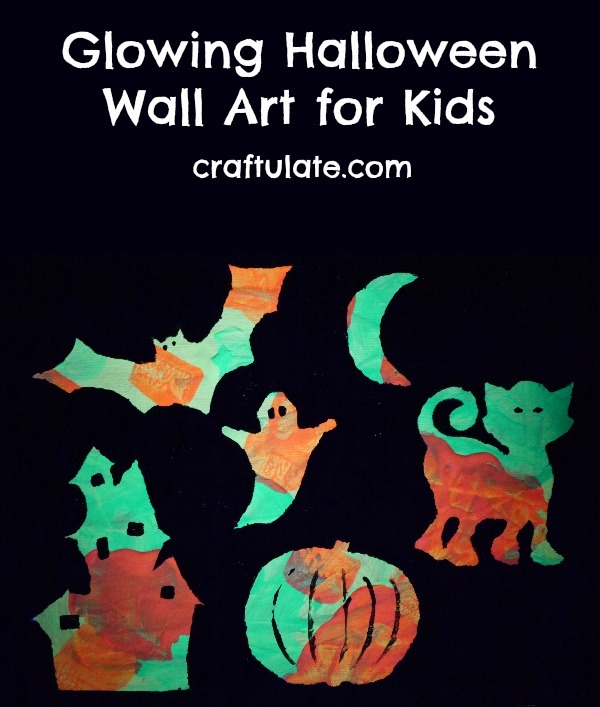 …but with some the help of a Blacklight – it looked super fantastic in the dark! Just “charge up” the paint, then switch off all the lights!